Great Oaks in Ellicott City, Maryland knew they were getting new, gabled entryways with columns throughout their property in its reconstruction project. But the columns that could be seen from the road also made a huge difference. These new columns were installed at select entries, and these entries also received new, decorative replacement entry doors and a standing-seam metal roof detail that greatly enhanced the look of the buildings. Additional components of the project included new gutters, new shutters, 75% deck replacement, concrete replacement, and amenity upgrades at the pool house. The property also received a full paint job. 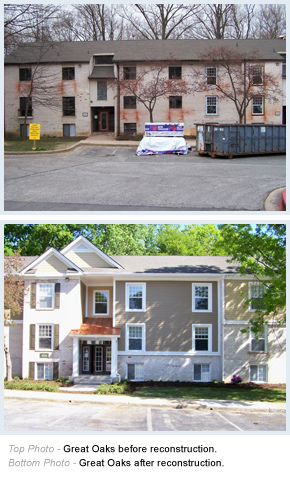 In addition to entryways with columns, AAPCO installed house wrap and Hardie® siding on select areas of the body of the buildings, with some of the Hardie® being installed over brick. Part of the major renovations included new windows and new patio and decorative entry doors. And prior to installing the new windows, AAPCO enlarged the brick window openings. Greatly adding to the property value was the roofing replacement performed at Great Oaks. And as mentioned above the entry covers received a standing-seam metal roof detail as part of the major repositioning. Another element of the repositioning included the installation of new PVC rails.